Weekend insurance leads: Are you missing out on some of the most profitable purchased leads? Are you missing out on some of the most profitable purchased leads? Clearly, when people who know they need insurance reach out to you proactively, as an agent you enjoy a happy alternative to guessing who may be a candidate and contacting them out of the blue. Successful insurance agents have discovered that purchased lead programs deliver motivated customers right to them . . . and that quality weekend leads are among the best customers. Both new and inexperienced insurance agents face challenges in consistently identifying more people who may benefit from their services. Sure, there are long-standing ways to approach possible customers—sales calls to friends and family, referrals from satisfied clients, contacts gathered at local networking events, keeping in touch with past customers and even online social networking—but dedicated agents still find it difficult to meet enough possible buyers to achieve their success goals. In addition, the process of proactively contacting leads, introducing yourself to strangers—or even those with a tenuous social connection—and then developing a deep enough relationship to explore and solve their financial issues can be intimidating, even to the experienced agent. If only there were an easier way to identify people who want to buy insurance now. Fortunately, there is. Internet shopping, with its ease and round-the-clock convenience, has enabled a new source of insurance leads: purchasing leads. Customers go online to shop for insurance and invite agents to contact them. What could be better than calling upon people who have asked to be called? - Fresh leads, automatically distributed to agents so that customers can be contacted promptly while their interest is still fresh. - Management of lead distribution so that a single lead is sold to only a specified number of agents and to only one captive agent at a time from the same company. - Complete, verified contact information. - A reliable return policy so that agents receive refunds if low-quality leads accidentally make it through the filters. 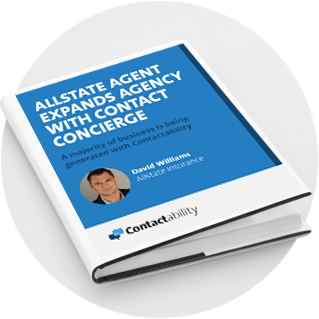 - Contact rates are better because consumers tend to be more readily available to speak to an agent. - Weekend leads are shared among fewer agents and therefore there may be less competition. - Customers may make a decision faster because they are more available to focus on insurance. Work issues and many other concerns are not competing for their attention. In short, agents who work weekend leads tend to have better contact and conversion rates with these leads. You’ll manage all your leads with greater ease and get more bang for your leads buck by installing a lead management system. This is a software program or a web-based tool for saving, organizing and administering leads. There are many management system providers in the marketplace, and all systems are largely compatible with leading lead vendors. However, it is best to check out all the details for the systems you are considering to select the very best match for your workflow. Automated contacts / follow ups. This process starts as soon as the lead is received. The system automatically sends an email to each prospect added to the database. That is so important because research shows that agents who are tops at client follow-up close at rates three times higher than for less efficient agents. The system can also send a text message (SMS / short message service) update to agents, delivering the lead to their smart phones or any hand-held device. If agents opt in to receive reminders of newly purchased leads, they can call the lead as soon as they get the notification, except for certain Do Not Call restrictions. Routing the lead to you for immediate attention and action. Speed in your initial contact with the customer provides you with a competitive advantage. Monitoring and measuring your progress. Many systems help you track each lead’s standing in the sales process. Organizing information to stay on top of x-dates. Using an automated system is so much more efficient than managing miscellaneous notes and scraps of paper . . . especially if you purchase the 20 to 30 leads per agent per day that experts recommend. Drip marketing. You’ll want to keep in regular contact with customers. To do this, you will need a system in place that utilizes automation for maximum effectiveness. Your staff will be freed up for other work, saving time and money. Keeping pace with competitors. Your competition benefits from lead management systems. Shouldn’t you too? Your agency need not be open weekends to receive and work these leads because you can access them via email or text message. Simply phone the customer upon receiving the information and confirm that you will follow up with an accurate quote first thing on Monday. This shows the customer that you are eager to help and will start to build rapport with her. Of course, just as on weekdays, you cannot call prospects between 9:00 pm and 9:00 am under Do Not Call rules. Now that you have the lead, what will you do with it? The simple answer is: get on the phone and call the customer. Effective agents use multiple communications channels, including in-person meetings, email, text messages, postal mail and social media. However, for most agents, telephoning is central to forming trust-based relationships with customers. Phone as soon as possible. Research has proven that it is 20 times more likely for an agent to convert a lead to a sale if he phones within the first five minutes. 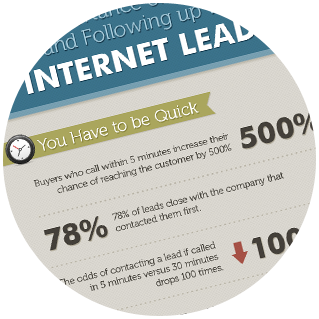 This is especially important when following up on purchased leads since most leads are sold to more than one agent. Demonstrate that you are a competent and caring professional. Be interesting and dynamic right from the start of the conversation. Answer customer questions with relevant, understandable information. Be helpful and patient to enable them to make the best decisions for their interests. Practice good manners. Don’t multitask—keep your attention on the customer and don’t let your mind drift to other issues or glance at email while you talk. Stay on the line rather than putting the customer on hold or cutting the conversation off abruptly. After all, you called them, they didn’t phone you. Call at a time that is convenient and reasonable for the customer . . . especially if they are in a different time zone from you. Leave helpful voicemail messages. If the customer doesn’t answer, always leave a complete message, including name, agency, reason for the call and your phone number. (This last piece of information should be at both the beginning and the end of your message.) Speak slowly and clearly, but also make the message as concise yet appealing as possible. Most important, don’t leave a price quote in the message because this conveys that your product is a commodity and price is all that counts in the customer’s decision. Be pleasantly conversational on the phone. Stand up and smile when you talk—believe it or not, this makes a difference when you are phoning. Use the customer’s name since people respond well to hearing their name. Mirror the customer’s conversational style. And try to overcome any negative responses without getting defensive or angry. Follow applicable Do Not Call rules. Agents cannot call prospects after 9:00 pm or before 9:00 am. Are you benefiting as much as you can from high-quality, purchased insurance leads, especially on weekends? Our only mission here at Contractability.com is to help you close more sales and generate more income for your agency. Let us help you initiate or improve your marketing using purchased leads. For more information, please call us today at 877-323-7750 or visit Contactability.com. Agent Ethan Kosmin generated over $200,000 in premiums during his first year in business thanks to Contactability.